Tori and I spent a day at Universal Studios in Orlando. I hadn't been to the park in about seven years (although it might have been six), and Tori hadn't been in several years, either. We surveyed our lunch options and went with Richter's Burgers, where I had a burger and Tori had a chicken sandwich. Nothing awesome, but it was good and filled us up for the rest of the day – no dinner needed. In my second class on the very first day of ninth grade, I met a boy named Alan. He was new to our 6-12 school, and the only person he knew was one of my best friends at the time. So, we had lunch together that day, and became good friends (we had 4-6 classes together each year), and we've kept in touch through the years. He lives in Georgia now, but whenever we're in Florida, I try to ask him if he'll be around (he has family there). Luckily enough, he was in Orlando for a conference while we were in Melbourne for a week, so we made dinner plans one night. I was down in Jupiter, FL playing dodgeball with my brother and sister. After the game, we went to the after-party at a dive called Average Joe's, but it was, um, a dive, LoL. So, we left and went to Cheeseburgers & More, since a couple of the guys had been there and agreed the burgers were good. It wasn't the greatest place ever, and I certainly wasn't as impressed as some (neither was Kyla for that matter), but they did have some great onion rings. I also got out of there for $10 with tip, so not bad in that perspective. We had all thought there was a good ice cream place nearby. We walked across the bridge to New Hope (PA) and back, and ended up getting ice cream at Buck's Ice Cream & Espresso Bar around the corner from Buho's. I had a scoop of mochachinno, Kasey had mochachinno in a waffle cone, Michele had a chocolate peanut butter milkshake, and Jonathan had a black cherry milkshake. Nobody had anything outstanding to say, it was all rather average. I wouldn't bother again, especially for $3 for a small. Plus, we found out later that there was a Rita's just a few blocks further than we had originally walked, haha. It's HARD to find good Mexican in our area of Pennsylvania. In fact, it's rather difficult to find any Mexican that's non-chain AT ALL. So, when Kasey & Michele mentioned that they liked a Mexican place in downtown Lambertville (NJ) we met them for a weekend lunch. We actually had a difficult time getting there, since we had a horrible rainstorm that lasted three days, and left downed trees and washed-out roads everywhere. At one point there was a tree blocking the entire road, so we had to backtrack and go another way. Good thing we took the Charger, it had much higher ground clearance than the Corolla! The meters run from 1pm-9pm on Sundays in Lambertville, so it was also lucky that we picked up two quarters the night before from a parking lot, haha! It also turned out that we had walked by Buho's before, as it's right next to a puzzle and game store. The place had it's ups and downs. We were almost the only people there, so we had quick service. I get the impression it's family-owned, and the English spoken by the employees was not the greatest. Actually, the place reminded me quite a bit of Salsa's, a Mexican restaurant in downtown Melbourne (FL). Which, if you didn't click to read my old review, means I didn't care for the place. The rice had corn AND peas in it... a big "no" for me. The cheese was minimal, the sour cream was flavorless, and the lettuce was overdone. Oh, I had chicken flautas... corn tortillas baked with (dry) chicken inside, topped with sour cream, lettuce, and a small sprinkling of cheese. Even the guacamole was chunky and flavorless. Jonathan felt very much the same about his entree, pointing out that even the guacamole was plain. Kasey and Michele have been there probably a dozen times (and Kasey got the same thing as Jonathan), so they must just look for a different flavor than we do, LoL. I will say this... they had an excellent queso fundito (an appetizer we all shared), and great salsa (3 kinds) and chips. The chips were homemade, warm, baked, and fresh. The queso was verrrry cheesy and had some great chorizo in it. However, it was overly greasy and I wouldn't get it again, especially for the price (although, I'm sure it's actually worth that amount in ingredients, LoL!). Yes, we've been dining out a lot lately. It seems that since the snow has stopped, everyone has come back to life and our social calendar is filling up again. But, when we're introduced to fantastic little places like Oishi, it becomes apparent how wonderful evenings dining out with friends are. Bryan & Emily suggested we all go for sushi, and Oishi is a place that they've discovered in Newtown. It's incredibly popular with the locals, and even with a reservation we had to wait twenty minutes or so for a table. Service is prompt and friendly, and there's no sense of urgency once you're seated, which is good. It's a BYOB place (many restaurants in PA are, because of the strict liquor laws), and it's the first time that Jonathan and I actually did bring in our own wine. We had picked up some Fu-Ki Plum Wine at one of our local liquor stores, and it was delicious. We also have tried the cherry flavor... I don't care for it but Jonathan does. 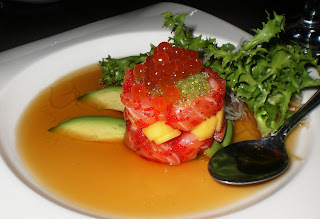 We started off with the Tartar Tuna, since that's a dish we liked a lot in Cali. But, it was very different here, and I'm not at all convinced it was worth $10 (aside from the very generous serving of caviar on top). It wasn't blended like tartars in Cali were... instead it was arranged in a little cylindrical tower with mango. It was okay, I wouldn't get it again. The photo is impressive. Bryan and Emily had some edamame, which was served warm and salted here, unlike at Mirim. Jonathan liked it, too. The entrees came with soup or salad, and I was the only one who went with the salad. And that was the wrong choice, LoL. The dressing was heavy and hard to define. I'm still not quite sure what it was, but I know I'd never get it again (which is odd for me to say... rarely do I meet a dressing that peculiar). Everyone else thought the soup was very good, a miso-mushroom mix. They went for the sweet potato roll, Jonathan and I had a salmon roll. The sweet potato roll has tempura inside, which was new. Jonathan tried it, I passed. Rave reviews. The salmon roll was very fresh and quite delicious. Jonathan had Thai Green Curry, which was a variety that I had never seen before. They use different peppers to make it green, apparently. He thought it was bland, and didn't seem to enjoy it as much as he might if it was red curry. Bryan went with a bento box-type meal, and seemed to enjoy it all very much. I really liked the shape of the dish, it was large with three domes dug out for the items, neat! Emily had a sushi platter, and I went with Chirashi (fish on top of a pile of rice, as opposed to each piece of fish on a little pad of rice). It was my first time having octopus, but the rest were all fish I knew. Octopus tastes exactly like you might expect... chewy like calamari, and there are some sucker-like pieces on it. The white tuna was divine. I'm talking like top 3 white tunas I've ever had. The whitefish was also delectable, and that's coming from a person who generally giver her whitefish to her husband, LoL. I thought that the salmon was average (three pieces of regular and three pieces with WAY too much roe), and so was the tuna. Emily had many of the same fish (no octopus tho, she had clam instead, which she was was very chewy), and also a California roll (with crab, FL folks). If/when we go back, I'd probably get a more specialized dish (chirashi is very generic, in my opinion), and certainly the soup instead of the salad. Actually, they have a lot of noodle dishes, so I kinda wanna go back to get a feel for their non-raw stuff, LoL. Now, it's not our normal style to review places that we've been to more than once. Normally, if we've been to a place before (regardless of location), I don't do a review. But, it has been several years since we've been to Benihana, and so much has changed. My friend Dani was celebrating her birthday at the Benihana down in Montgomery County, so we drove down there (about half an hour). We were seated immediately (we had a reservation), and service was very good throughout the meal. Our chef, Javier, mentioned at one point that it was only his third day, but we all thought that he was joking, since he was very good at almost every trick. Jonathan and I had the Chicken & Shrimp for Two combination, which was a fantastic deal. Just $35 and we each had a bowl of onion soup, a salad, a shrimp appetizer, a meal, and a choice of desserts. We had forgotten how relaxed of an atmosphere Benihana is. We've been going to other hibachi grills all over the place, but Benihana truly is different. The pace is much slower... it took almost an hour and a half, instead of the 45 minutes-to-an-hour that other hibachi grills do. The soup was as good as I remember, but I must admit that we were both really hungry so we gulped it down pretty quickly. The dressing on the salads is so unique there, as well. Tasty. Then, he started cooking the zucchini and the onions, even though we'd get the zucchini first and the onions very last, which was interesting. Plus, when he went to do the volcano trick with the onions, he even added lava, which was a new trick to me. Six of the seven of us had fried rice (which has gone up a LOT... now it's $3.25 extra per person), and Javier did a Pac-man trick that I hadn't seen before, so that was cool. The fried rice could have used more soy sauce (and there wasn't any on the table itself), but was still yummy like I remembered (although I won't lie to you, Jonathan makes some amazing fried rice!). The shrimp, both in the appetizer and in our entree, were very plentiful, excellently cooked, and delightful in flavor. Add in the ginger-flavored dipping sauce and you have a winning combination. The chicken was a tad dry (I think it was just on there too long), but with the mustard sauce it was fine for the most part. Others at the table got scallops, steak, tofu, and even tuna. Everything looked delicious, and it was the first time I had witnessed someone order the tofu (interesting cooking process) and the tuna (lots of special vegetables cooked with it). The weird part is how heavily they use sesame seeds now. I am quite sure that they were used sparingly if at all back in the 2001-2004 era. Now, they were used on EVERYTHING except the shrimp, the rice, and the onions! And not lightly, either. Chicken, steak, tuna, tofu, zucchini, all COVERED with sesame seeds these days. Crazy, eh? Don't get me wrong, it was still all very good, but quite the change. Birthdays are celebrated in a lot of rambunctious noise now as well. Tambourines, drums, and rubbing a buddha's belly while blowing out a candle are all part of the chaos. I had some delicious strawberry ice cream (Breyer's, I'm pretty sure), and Jonathan had the rainbow sherbert (very good as well). All in all, a good time. Quite a bit different, but still very good. And it was very relaxing to have a longer dinner than the normal hibachi places (probably why most you can still walk into, but you always need a reservation at Benihana). Jonathan had a business lunch at JB Dawson's shortly after we moved here, but was rushed on the food part. We both went there once, but they only had one television and FSU was playing, so we had to go elsewhere (Langhorne Ale House). We have friends who are always recommending their happy hour, so we decided to give that a try. It's a small chain (three locations, all in PA) with a decent-sized menu. The place is pretty big, and was decently busy on a Tuesday night. We sat at the bar, and the bartenders were pretty friendly. They make a good airhead (cranberry juice & peach schnapps, but beware they don't count it as a "well drink" in their happy hour special), and they have half-price appetizers from 5-7pm as well. We had Italian fries ($2!! ), ahi tuna, and a half-pepperoni-half-tomato-and-basil flatbread. The fries were pretty good in flavor, but they're the super-skinny, kinda floppy fries, so I don't know that I'd get them again. The ahi tuna was good for half-price, but I wouldn't have paid full price. There was a strange mustard-horseradish-something sauce drizzled on it that I wasn't too fond of. The flatbread was really good, and I'd recommend both flavors. Our friends have had many of the appetizers, and didn't have any that they wouldn't recommend, so the place is pretty much a winner up to this point. The burgers and ribs look good, too, so we may be back. We actually left the house with the intention to get pho at Savor Saigon. But, we forgot that they are closed on Mondays, so we searched Yelp and found a good sushi place a mile away. Mirim Japanese & Korean Restaurant looks kinda seedy on the outside, and it at the end of a small strip mall in Langhorne. But, the inside is really very nice. We had excellent service and excellent sushi. The menu is about half sushi and half entrees - some Udon noodle dishes and a bunch of Korean dishes. We chose four rolls and split them, and Jonathan also had a piping hot miso soup. He said it was pretty good. We were first served edamame, which I don't care for, but Jonathan thought it was okay. The sushi came out pretty fast, from the sushi bar that nobody was sitting at. We had a plain tuna roll, an Alaskan roll, an eel with cucumber roll, and a salmon-tuna with green onion strange-looking but FABULOUS roll (I also forgot the name, LoL). They were all pretty good, and aside from some of the tuna being a tad past ultimate freshness, it was all very good. Pricing was a smidgen high, considering rolls are 6 pieces instead of 8, and they were average in diameter. BUT, finding fresh sushi close to home is difficult, and this is certainly a contender in that department. This year, time almost got away from us when it comes to snowsports, since we only got around to spending a day in the mountains in the first week of March... after peak ski season in this area. But, we did it. We went to Camelback. About 3:30pm, we broke for lunch, and had fantastic food and service at Thirsty Camel, with a pretty good cover band playing. I had the Italian wrap (one of the best I've ever had, actually), which came with Italian dressing and some yummy tortilla chips (and a pickle). Jonathan went with a cheeseburger and waffle fries, both were delicious. Our server was very attentive to bringing me water (I downed four glasses), which made me happy.